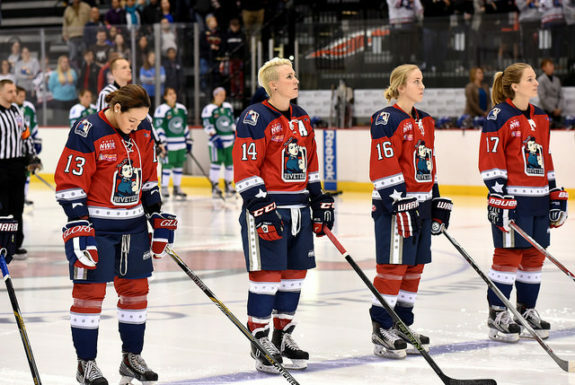 The New York Riveters had been through a lot this past week, as had all of the players in the NWHL when the news broke that the second-year league would be forcing a pay cut in order to keep from folding. 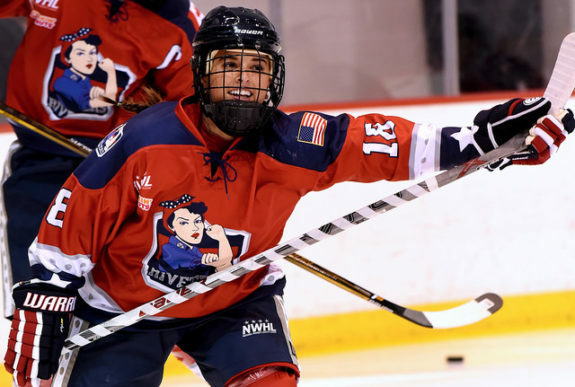 But maybe for the Riveters, more than the other three teams, this can be a rallying point – for their team more than any of the others had the most turnover on their roster from last season. They had already started to show signs of gelling when they took three of four points in back-to-back games in Buffalo, and followed that up with their first shutout in franchise history, a 4-0 home win over the Connecticut Whale. 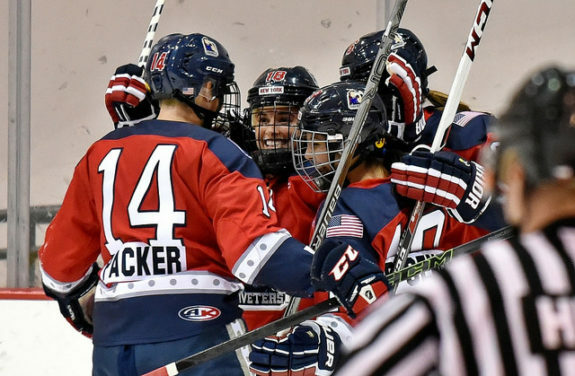 Led by Rebecca Russo’s offense (two goals) and Katie Fitzgerald’s saves (28), the Riveters moved into second place without three key injured players (Amanda Kessel, Courtney Burke, and Kiira Dosdall) and finished the month of November without a regulation loss. This was three days after the stunning news that they received as a group prior to practice. But when they hit the ice for their sixth game of the season, hockey was their sole focus and it showed as they played perhaps the most complete game in team history. “I can’t get those goals without the passes from Packer,” said Russo who scored on both of her shots on goal in the game/three of 12 this season. “I think today that win felt extra good, I’m pretty happy all around. 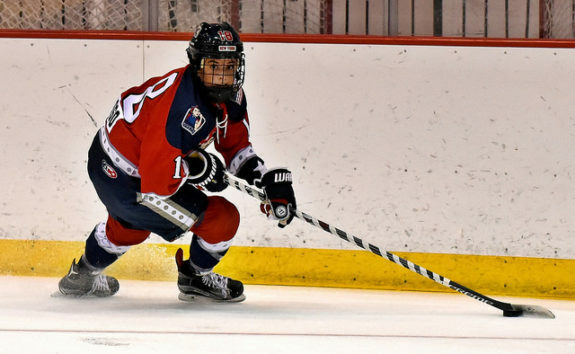 Although she only had two shots on net, there were many chances her entire line had throughout the game, and their speed often caught the Whale flat-footed and scrambling. Russo displayed the same speed that got her noticed (and earned her a job) at the NWHL’s Free Agent Camp in June at this same building. Just being around Russo for a few minutes you can see why she is successful. She’s confident, always smiling, likes to crack jokes, and on the ice – she leaves it all out there – a hustler, a team player, and a battler. She was skating around some Connecticut players in the game like they were cones during a camp drill, not professional players. Chances are she was doing it with a smile too. One that may not have been on her face too often the past few days. “Not going to lie, it was in the back of my mind,” Fitzgerald said with a huge grin when asked if she was worried about giving up a goal during the Whale’s late-game push towards her net. “But, it’s always in the back of your mind; you want that shutout. At that point, I was just happy with the win. We had three goals – and Kaleigh Fratkin sold herself out (to block a shot, inevitably with her hand); beauty, I loved it. Everyone sold themselves out for the team. Everyone did what they had to do to get the job done…and it worked out well,” she added with a laugh. “She’s a great kid. She’s a big goalie. 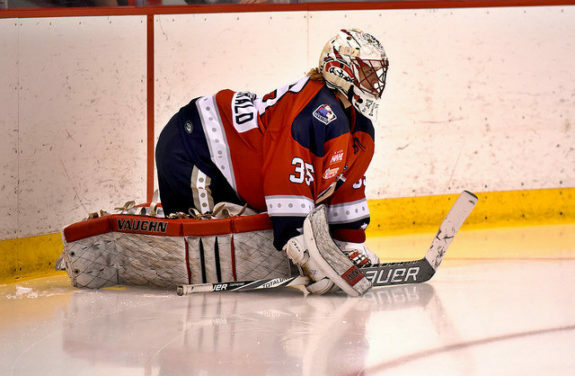 She’s coming into her own, she’s building confidence,” said Wiseman of the goalie he signed to replace the injured Jaimie Leonoff, right before camp. “With everything going on this week, we actually got better. Our team came together and a lot of positives came from this week,” Wiseman said following the game. “The girls are putting their heads together for different ideas to move forward with the league. Our team wants to play, and they want this league to succeed. I think maybe we were the only team this week that got better.” Winning helps that too, and it builds a culture of success. Even though many probably feel enthusiastic about just playing hockey like Fitzgerald admitted, winning makes it even more fun, helps a lot of new faces become new friends, and it makes the memories sweeter. “Work ethic and skating,” said Fratkin describing her team’s recent success. “We have a lot of speed on our team, all the way through; and last weekend when we played Buffalo we used our speed and our work ethic (to our advantage). We have a lot of grinding hockey players out there, but we also capitalized as well. I think when you’re playing a team like Connecticut, where they have three really deep lines – they have a power first two lines in terms of scoring – the biggest thing is you want to capitalize.